The St. George Queensland Reds took to the battlefield at Delta Force Paintball in Petrie today to kick off their 2014 pre-season training with a military-style team building event. New Reds coach Richard Graham has been vocal about the importance of team cohesion from the beginning of the new Super 15 season and he wasted no time in gathering the troops for a day of outdoor adventure that will be sure to strengthen team morale.Â “It was a perfect team building day; the fact that it hurts a little makes it even betterâ€¦. means that there is more in it.” Greg Holmes said. Boasting Wallaby playmaker Quade Cooper, the Reds displayed impressive skills out on the paintball field with several teammates showing exactly why they were amongst the countryâ€™s most competitive and feared athletes.Â â€œI would 100% come back to play againâ€ Quade said. Utility player Ben Lucas believed the paintball event was a success and provided the ideal backdrop for some of the younger players to show off their skills against the older team members. “The Upgrade Guns are awesome. We destroyed them!â€ said Nick Frisby.Â â€œWe finished on Speedball and just went Hammer and Tong at each other. It was red hot. Really good!” Liam Gill commented. In recent years professional rugby teams have looked for new ways to focus on team morale, improve cohesion on the field and unearth future leaders. Paintball is growing in popularity as a team building event amongst the sporting elite with Delta Force Paintball also recently hosting the North Melbourne Kangaroos, the Parramatta Eels, Manchester United FC and Chelsea FC. 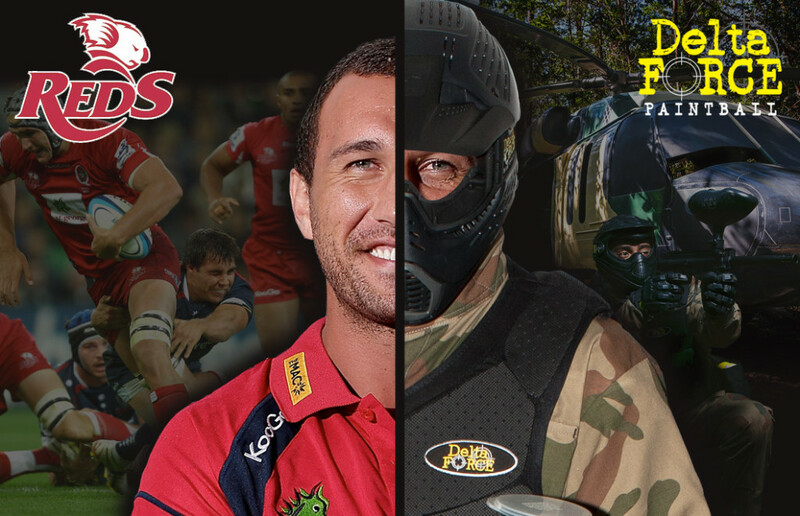 The paintball outing with Delta Force is rumoured to be the first of several military-style team building events for the pre-season with the Reds looking to kick off the 2014 season in style against fierce rivals the ACT Brumbies on Saturday 22nd February. For more information on organising a team building paintball event with Delta Force Paintball Â call 1300 769 223.